Shanghai is now home to the world’s largest 3D printed pedestrian bridge. The bridge, created by Central and South Land Digital Architecture Research Center Professor Xu Weiguo and his team, was built using self-developed robotic arm 3D printing concrete technology. The bridge spans over 86 feet and is nearly 12 feet wide. Before the bridge entered the actual printing construction phase, a 1:4 scale physical bridge failure test was carried out, and its strength met the load requirements of pedestrians. The whole bridge took about 450 hours of printing time to complete all concrete components. When compared with similarly sized bridges, its cost is only two-thirds of the cost. The bridge body consists of three parts: the bridge arch structure, the bridge fence and the bridge deck. A total of 64 bridge decks were also made via 3D printing. The printing materials for these components were all composites made of polyethylene fiber-concrete with various admixtures. Not only was the entire bridge 3D printed, but it’s also embedded with a real-time monitoring system that includes vibrating wire stress monitoring and high-precision strain monitoring systems. It can collect the force and deformation data of the bridge in real time, which has a practical effect on tracking the performance of new concrete materials and the structural mechanical properties of printed components. It is expected that this type of intelligent construction will be important to promote the transformation and upgrade of China’s construction industry. 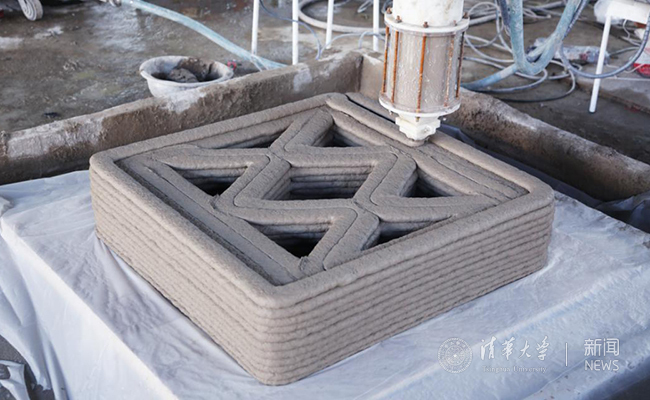 Currently, there are still many obstacles that need to be overcome in 3D concrete printing construction. The competition in technology research and development and practical application in this field is also increasingly fierce. There are quite a few scientific research institutions and construction companies in the world that have been committed to technical research in this area, but this technology has not really been used in actual engineering. The completion of the pedestrian bridge marks a step in the right direction for this technology from research and development to practical engineering applications. At the same time, it marks the entry of China’s 3D concrete printing and construction technology into the world’s advanced level. The robotic arm 3D printing concrete system developed by Professor Xu Weiguo integrates innovative technologies such as digital architectural design, print path generation, operation control system, and printer front end. It has good work stability, fast printing efficiency, high molding precision and continuous Features such as work. The front end print head of the robot arm has both stirring and squeeze push functions. Body design, reasonable path, pumping, front end, robot arm movement and other systems are connected to work together. Professor Xu Weiguo has been engaged in digital design and digital construction research since 2003. He promoted the rapid development of digital architecture in China through various channels such as teaching, engineering, curatorial, and publishing.